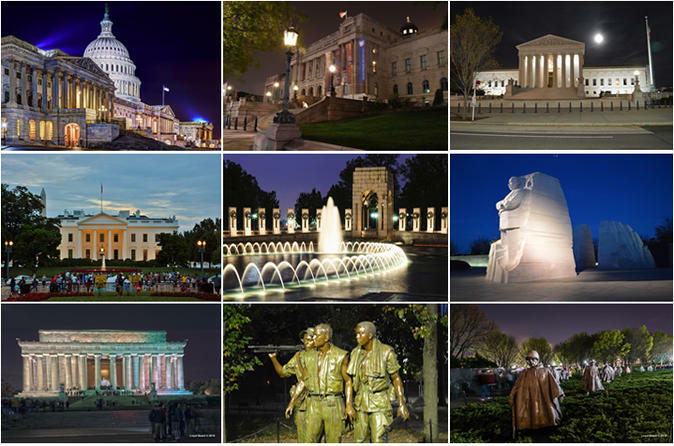 See the top attractions of the National Mall at night on our 3-hour guided, small group tour as iconic Washington DC sites take on a spectacular glow against the darkening sky. US Capitol, White House, World War II Memorial, Thomas Jefferson Memorial, Martin Luther King Jr. Memorial, Korean War Memorial, Lincoln Memorial, Vietnam Veterans Memorial, and the Korean War Memorial. Bureau of Engraving and Printing, The Holocaust Museum, National Archives, National Gallery of Art, Tidal Basin,the Washington Monument, African American History and Culture Museum, FBI Headquarters, Canadian Embassy, Department of Justice, and much more. Night Tours are approximately 3 hours in length. Several Restroom breaks along the way. Our vans are equipped with various types of phone chargers. We will drop off your group off as close as legally possible to sites but there will be some walking; wear comfortable shoes! If you choose not to walk at all you may remain on the van.